For a reasonable guide fee, I´ll hop on-board with you, if you would prefer to fish from your boat. (Assuming you have a "fishable"/safe boat rigged for bass fishing). Let me know what lake you have in mind. Includes Guide + up to 2 people. A $100 fee applies for a third person. Payment may be made online via PAYPAL. I also accept Cash, Personal Checks, Visa, Mastercard, American Express and Discover. Deposit can be made by using PAYPAL, or sending personal check. Balance due on, or before the start of your trip. Pay on-line with PAYPAL. If paying the day of trip, cash only. In case of "unfishable conditions", a reschedule date will be set. 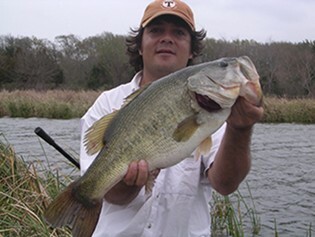 All participants must have a valid Texas, or non-resident fishing license. If you don’t bring a camera, I will make sure that you get photos. We will fish from a 19.3' Stealth DX-190 bass boat powered by a 175-EFI Mercury. 82 pound thrust (24 volt) Trolling Motor, with 2 GPS units. There is nothing like catching a fish on your own rod & reel. However, if you would prefer, I can provide high quality tackle and equipment from industry leading manufacturers. I’m a bit of a "gearaholic" and have healthy supplies of Shimano, Daiwa, Pinnacle, Abu, All Star, Castaway, Falcon, and much more. Note: I encourage and practice catch and release. Fish cleaning services are not included. Contact Ryan Wags for booking an outing.